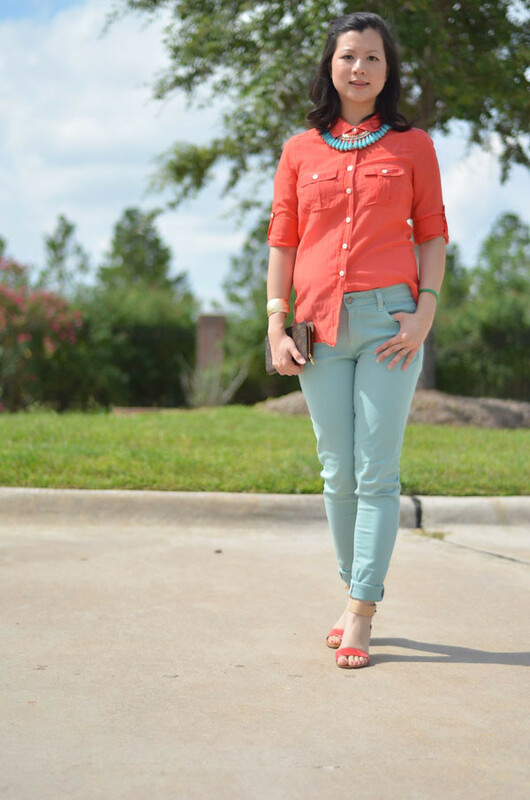 This challenge is all about the colors Coral and Mint – two of the hottest trends this year. I have been sporting LC Lauren Conrad Pencil jeans in Mint (here and here) and these really comfortable Paige Denim leggings. Coral has been a favorite color of mine for quite a while. If you are a frequent reader of my blog, I love Coral. These wedges have been in almost every blog photo for the past 2 months. I’m also in this Coral Colorblock top in this post here and this Creative Fashion Glee article here. Very cute! I love your shoes! Thank you Kristina for stopping by! Thanks! I have been living in mint and coral for a couple of months now. Love everything about this look! Love the half tucked shirt and the buttoned up collar. So stylish! And those shoes…amazing! Thank you so much! The shoes are so comfy. It was one of my best summer purchases.